Rotherhithe 1992 by David John. Vitreous Glass Mosaic. 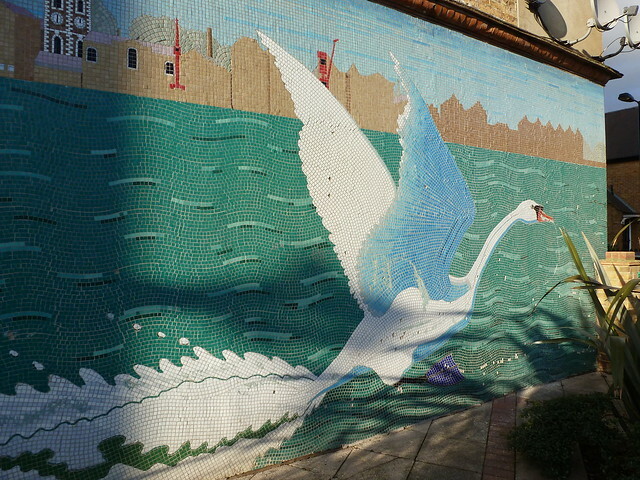 Wondering around Rotherhithe, it's wonderful to stumble on this simple but striking mural illustrating the local waterfront and the present of mute swans in the area. The design for the mural was chosen through a competition with which the winner was decided by a group incorporating some of the local residents. The piece is hard wearing however mosaics are still susceptible to damage. It is odd that the local council has decided to place large plants in front of the mural as some of the impact and detail of the piece is hidden. Hopefully they will one day remove the planting to reveal this striking piece again. Overall the mosaic is in pretty good condition. However, there are tiles missing in areas. A small repair would refresh the piece. From Rotherhithe station, step out onto Brunel Road and head left. Take your first left onto Swan Road. The mural is at the junction with Kenning Road.